Join the Miss Gay Louisiana America family for a night of Classic Southern Glamour. Parfum de Louisianne is sure to stimulate all of your senses with a themed presentation on scents found all across Louisiana's cultural bouquet. Qualified contestants from city preliminaries will be competing to claim the title of the next Miss Gay Louisiana America. Forever Miss Gay Louisiana Americas will be in full regalia, entertaining and kiki-ing throughout the week. Glittering Jewels of the Miss Gay America Royalty, Deva Station and Catia Lee Love will be in atendance. 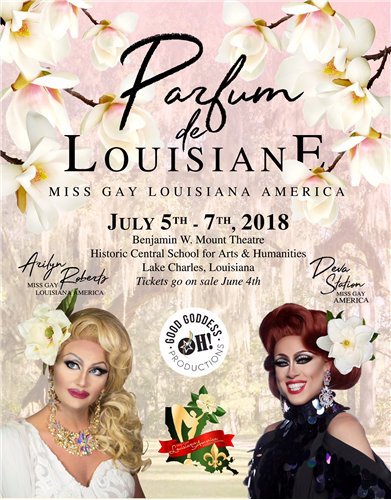 Come watch as the reigning Miss Gay Louisiana America, Arilyn Roberts crowns her successor.